A development of the Lagonda 2-Litre that was driven by Andre D'Erlanger and Douglas Hawkes to 11th place overall at the 1928 Le Mans 24-hour race, the 'Low Chassis' model was introduced the following year. Benefiting from a redesigned front axle (complete with rerouted braking system) and rear suspension spacers etc, its reduced centre of gravity resulted in notably sharper handling. Powered by a 1954cc 'twin-cam' four-cylinder engine that boasted hemispherical combustion chambers and inclined overhead valves, the 'Low Chassis' was reckoned to be good for 80mph (though this was somewhat coachwork dependant). Concerned that rivals such as Alvis and Sunbeam were beginning to offer cars of similar performance, the Staines-based company unveiled a supercharged derivative at the Brooklands Fete on 19th July 1930. While, the attendant demonstrator wore a Powerplus single-rotor assembly, the majority of 'blown' production cars were specified with either Cozette No.9 (4psi) or altogether rarer Zoller (5-7psi) units. Among the earlier supercharged 2-Litres built, 'GK 3466' was proudly displayed on Lagonda's stand at the 1930 Olympia Motor Show. As part of its 'Cars At The Show' report, Motor magazine commented as follows: "Of outstanding interest is the new two-litre supercharged car, which is being shown for the first time . . . The blower looks part and parcel of the whole design, as the matter in which it has been fitted is exceptionally neat . . . The chassis is shown with a sports semi-panelled four-seater body with all weather equipment, and with the bottom half finished in broken white and with the top in black, which makes a particularly attractive exhibit. The upholstery is of grey leather, and the price complete as shown is £775". Quite apart from being particularly attractive, the tourer's black and white colour scheme also mimicked the livery of Lagonda's Works racers. An avid motorist, T.C. (Conrad) Mann certainly seems to have had competition in mind when he bought 'GK 3466' off the Motor Show stand. The improved power and flexibility bestowed by its supercharger allowed 'GK 3466' to make a real impression on the 2-Litre class of the Monte Carlo Rally. In 1931 it was awarded the Condamine Cup for best performance in the braking and acceleration tests, came second in the 'Confort' class and ascended the famous Mont des Mules hillclimb faster than any other 2-Litre car; a feat it repeated the following year (though, on that occasion the Lagonda also set a new class record of 3 minutes 33.6 seconds). The Staines-based manufacturer was understandably keen to establish the reliability of its forced induction engine and so must have been appreciative of Mann's exploits but while he went on to campaign another 2-Litre and a M45 neither of these later machines proved as successful as 'GK 3466'. The Lagonda's fate over the next few decades is something of a mystery. Like many older, high quality cars it appears to have been converted into a shooting brake during the aftermath of World War Two; a time when load-lugging trumped performance as an attribute. There is some suggestion that this work was carried out by professionals if only because the car was re-classified with the registration authorities and many years later its rear springs were found to contain extra leaves (indeed, the current V5C Registration Document gives the body type as 'Estate'). Rumoured to have been an Edinburgh resident during the 1950s and 1960s, the 2-Litre then wound up in a Yorkshire farmer's field alongside fifty-four other cars (including several other Lagondas). Identifiable as the former Monte Carlo Rally veteran despite its dilapidated condition, 'GK 3466' was rescued by Richard Procter of Plus Four Motors and sold to architect and hotelier, John Horne of Ambleside, Cumbria in November 1986. The car's restoration was overseen by Charles Battersby of The Garage in nearby Hawkshead, Cumbria. One of his team, Peter Griffiths, set about weld repairing any corroded areas on the chassis before it was despatched to local firm Roy Garner Motorbody for jigging and realignment. A new T2 Tourer body, ash frame, windscreen, dashboard panel, hood frame and the necessary aluminium panelling etc was commissioned from renowned specialists Vintage Coachworks of Hartley Wintney in 1988, while the following year witnessed an order being placed with Richard Hutchings for a replica Cozette No.9 supercharger which was later reworked by Chris Paling to accept PTFE vanes etc. Alan Brown of Knarr Mill, Delph was responsible for refurbishing the Lagonda 'Z' gearbox (as fitted to the blown 2-Litre and normally aspirated 3-Litre cars) with new gears and bearings during 1989. Mr Brown also rejuvenated the supercharger drive gearbox using new straight-cut bevel gears that same year (the 'box itself being an original Lagonda component). On the advice of Ivan Forshaw, the late proprietor of Aston Service Dorset and former Lagonda Club spares registrar, the car's original engine was sent to Barry Simpson Restorations Ltd of Totnes, Devon in August 1990 for a sixty-five hour overhaul (reground crankshaft, rebore, repaired con-rods, fresh pistons and new white metal bearings etc). Further engine work was undertaken by Charles Battersby including a new clutch and reconditioned rockers / camshafts etc not to mention a neat conversion so that the Autoklean filter housing would accept a modern, disposable cartridge. A new AC mechanical fuel pump and reproduction SU carburettor were sourced (the latter boasting an original bronze body) and ancillaries such as the magneto, starter motor and dynamo reconditioned. Ivan Forshaw and the Lagonda Club provided numerous replacement parts among them a set of instruments, sundry engine components, headlamps and assorted stainless steel nuts and bolts. The brake system was reconfigured to original specification but upgraded with stainless steel rods and new cables throughout, while Tuckers of Bristol re-cored the radiator. Progress on the 2-Litre continued during the 1990s but at an intermittent pace. Invited to Brooklands in August 1999 to celebrate Wilbur Gunn's founding of the Lagonda Motor Co Ltd a century earlier, 'GK 3466' arrived as a bare chassis with its engine, bulkhead and radiator only temporarily affixed. Charles Battersby sold his garage business that same year and so the task of reassembling the car passed to Ian Ronald of Gleaston, Cumbria. 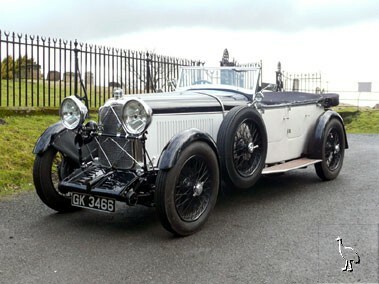 A recently retired mechanical engineer and fellow 2-Litre Lagonda owner, Ronald spent the next four years or so completing the rolling chassis, installing the engine and gearbox (together with their associated controls), mounting the body and its fittings and generally recommissioning the car. Typed records of all the work done between August 1999 and May 2003 remain on file. Suitably re-tempered the four leaf springs were refitted utilising new shackle pins and bushes. The front axle was overhauled and the rear 'heavy' type one uprated with modern lip-style oil seals (though, its existing 41x10 crown wheel and pinion set and half-shafts were judged to be sound). The steering box was similarly found to be in good order but the steering column shroud and steering wheel were remade. All the steering balls were renewed as were the king pins, while the steering arms were hand-filed and polished prior to reinstallation. Benefiting from new stainless steel control linkages and a John Oliver fabricated four-branch exhaust manifold, the engine ran for the first time in more than a generation during February 2001. That same year saw the body attached to the chassis (with seats, floorboards, toe-boards and rear footwells soon added), the instruments overhauled and the car rewired using braided and armoured cable. Relocating to Vintage Carriages of Knarr Mill, Delph at the end of March 2003, the Lagonda was treated to a new front valance, bonnet and wings. John Nicholson of Cockermouth retrimmed the tourer early the following season. Thus, by the time that John Horne and his partner Verena Casket collected a Transport Trust Restoration Award from HRH Prince Michael of Kent in June 2004, 'GK 3466' had been all but returned to its former glory. Sadly John Horne suffered a fatal heart attack just a few weeks afterwards and work was suspended. Verena Casket sold the car during January 2006 and it entered the current ownership via Derek Green of Cedar Classic Cars Ltd, Hampshire some four months later. Since then the 2-Litre has had over £6,000 worth of improvements carried out by Cedar Classic Cars (repaired cylinder head, overhauled carburettor and sundry fettling). Though, more recently Brewster Mudie Ltd of Stoke Prior, Worcestershire has assumed maintenance duties, rejuvenating the oil pump and preparing the car ahead of various events such as the Vintage Sports Car Club's Measham Rally and the Lagonda Club's Densham Rally (the latter outing providing an unexpected victory during 2007). Boasting one of the longer entries in the Lagonda Club's roster of 'Noteworthy' cars, 'GK 3466' also features amid the competition history chapter of Bernd Holthusen's authoritative tome 'Lagonda' (pp 115, 117) and in Arnold Davey and Anthony May's book 'A history of the marque, Lagonda' (pp 225, 232, 234, 241, 242, 244, 247, 261, 297, 332, 373). Finished in its evocative 'Motor Show' livery of black over white with grey leather upholstery, 'GK 3466' is described by the vendor as being in "very good" condition with regard to its engine, four-speed manual gearbox, electrical equipment, interior trim, bodywork and paintwork. While, he further informs us that performance-wise the supercharged 2-Litre is by no means embarrassed by his Vauxhall 30/98 - high praise indeed! The subject of a recent feature article in The Automobile magazine and exhibited on the H&H stands at both the Race Retro International Historic Motorsport Show and Techno Classica Essen over the last few months, this truly historic, Vintage Lagonda is offered for sale with history file, current MOT certificate and FIVA ID card.